In collaboration between Accounting Student Club (ASC), BINUS International Business Society (BIBS), & BINUS International Marketing Club (BIMARC) along with the support from departments, and SAGE, BIBS x ASC x BIMARC proudly present the talk show from FinTech peer-2-peer lending ASETKU. 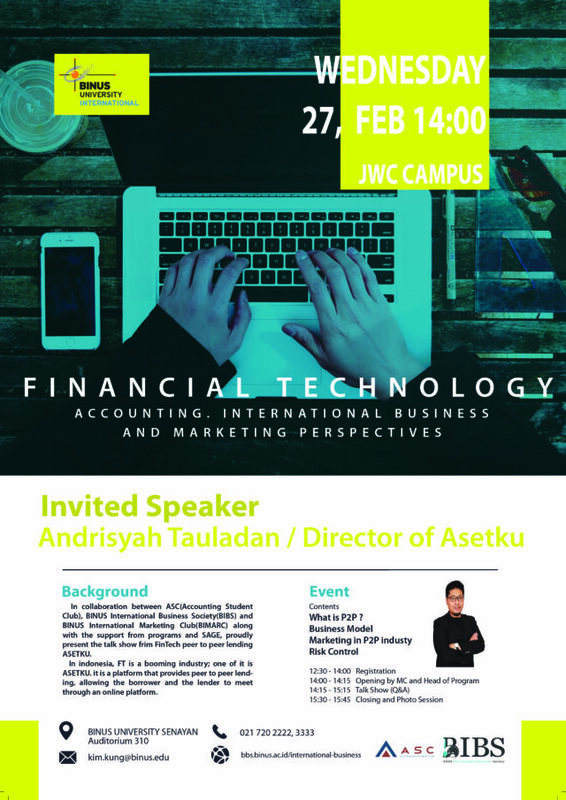 This event will be held on February 27th, 2019 at BINUS International JWC Campus, room 310 with the expected audience of 50 students from various majors in Binus International. In Indonesia, Financial technology is a booming industry; one of it is ASETKU. It is a platform that provides peer to peer lending, allowing the borrower and the lender to meet through an online platform. ASETKU provide easy access for people who want to borrow money or invest their money; People do not need to go through a very long process in order to receive a loan, it is also beneficial for the people who want to invest their money through ASETKU since they are offering various types of investment product with variety of interest that are beneficial.